Robert was born in 1975, the same year Microsoft incorporated. The timing was perfect to allow him to grow with personal and corporate use of technology. His young curious mind was clear by the time he was three years old when his father caught him in the bathroom flushing socks down the toilet one by one – no doubt to figure out how the toilet worked. Robert was introduced to the personal computer at age 7 on the first IBM compatible computer, the Compaq Portable, with DOS v1.0, Lotus 1-2-3 v1.0, and a 5 ¼” floppy disk to store his files. Within a year, he started what would turn out to be his journey for the next 33 years – collecting and normalizing data. Young Robert would carry a yellow legal pad to fill with vehicle license plates, details, and locations that he would analyze in spreadsheets in anticipation that one day he could aid the local police in finding a car they were pursuing. He started to reverse engineer programs in BASIC when he was 9 years old using this process to teach himself how to write his own computer programs. 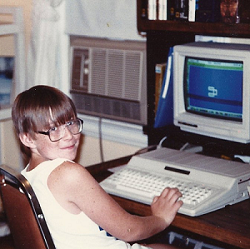 During high school, Robert had multiple computers networked together in his basement, with a dedicated phone line for his private BBS (Bulletin Board System), which was integrated into FidoNet (the predecessor of today’s email). He used ‘war dialing’ techniques to fish for financial, government, and utility company computers in the area. After gaining access to these systems, at 15 years old, he decided to only use his powers for good. Pursuing a career in technology was a natural fit—Robert not only had 10 years’ experience with computers, normalizing data, and programming, but it also joined two of his biggest passions – helping others and solving problems. He flexed his skills over the next two years at Fryer Company where he integrated state of the art digital imaging systems for a thirteen-state region that enabled scientists to perform DNA analysis, calcium ratioing, metallurgy, fluorescence microscopy, foreign object detection, and fingerprint analysis. Robert joined Technology Advisors in 1997 where he spent the next five years designing mission-critical software interfaces between sales, financial, and other unique systems throughout the nation. In 2002, he left the consulting firm to work for himself. Since then he has worked on several bleeding edge technologies – some of which has not yet been seen in the market. Robert leveraged his experience on his last major project when he proved an algorithm that would allow financial advisors to automatically update their software with current portfolio details and transactions for their clients. This technology would mitigate advisors from manually inputting data from over 10,000 data sources. Mr. Meissen has been solving complicated business problems by integrating data between over 24 various sources and destinations for the past 20 years in more than 32 distinct industries. Robert enjoys camping and snow-skiing; values simplicity in life, and appreciates helping others.